For all the beautiful ladies out there! It's time to leave the crowd behind you completely flabbergasted with our exotic collection of gold chains that has been elegantly designed to cater all your needs. These are anywhere and anytime accessories and are absolutely lightweight making it really easy to carry along. JewelStop presents you the Puffed Mariner Chain anklet and the one that enhances your style quotient in every way. The anklet is crafted in yellow gold properly stamped and marked. The yellow gold anklet has been designed in a way that makes it look simply ravishing. The yellow gold anklet is of a high quality and comes with 30 days money back. The package includes a jewelry box as well (domestic shipments only). So, hurry up and buy this amazing anklet at an equally amazing price. Please note that images have been enlarged to show better detail. The anklet is yellow gold in color. 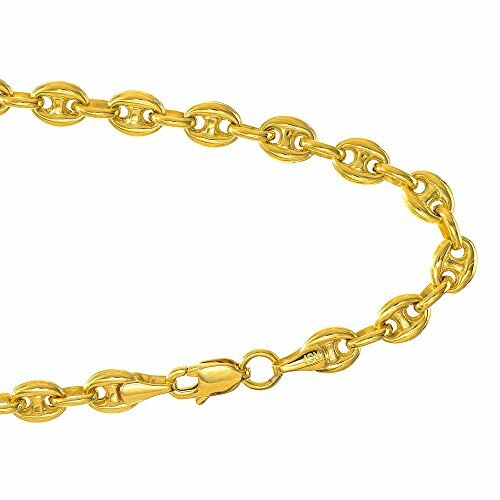 puffed mariner chain has a warranty of 1 year and 30 days money back guarantee. If you have any questions about this product by JewelStop, contact us by completing and submitting the form below. If you are looking for a specif part number, please include it with your message.